Special assortments of popular rubber nails, desk knobs, screws, hinge pins and other small items frequently ordered. Conveniently packaged in clear plastic boxes. 10 each of 17 sizes and colors of rubber nails and buttons - plus 1-1/2 dozen assorted wood top buttons. 32 pair assorted wood and brass desk knobs and buttons. 7 dozen popular size hinge pins. 1 pair Steinway Ball Tip hinge pins. 6 each Triangular Upright Keys. 18 sizes of flat head wood screws - 378 pieces. 18 sizes of round head wood screws - 408 pieces. 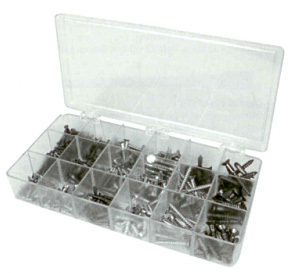 18 sizes of oval head and flat wood screws brass plated and nickel plated - 570 pieces. All are popular sizes used on piano hardware and hinges. The service and the product I ordered were excellent. I received the product very quickly.